A Spokane Police officer arrested Zoey S. King for allegedly jay walking and obstructing an officer in the urban core of downtown on Jan. 28. King was booked into jail that night. 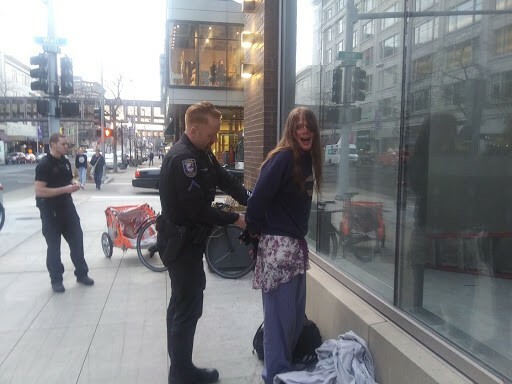 The incident strikes some critics, including Jon Lossing — a 37-year-old bike courier at Bruchi's in downtown Spokane who filmed King's arrest — as an unnecessary crackdown on a minor legal violation that people commit on a regular basis. As Lossing describes it, the arrest stemmed from King walking east in a crosswalk at the intersection of North Wall Street and West Main Avenue after her pedestrian walk signal had gone red. "The pedestrian had entered the crosswalk when it was flashing," Lossing tells the Inlander. "It wasn’t a hard red light because they were already halfway through." Spokane Police Officer Ben Maplethorpe was in his squad car going North on Wall Street when his traffic light turned green while King was still in the crosswalk. He then proceeded to pull over and confront King outside of the Macy's building, according to Lossing. "He decided to pullover, get out of his car, and then run up to the person," he says. "I was just passing by and I said 'this is ridiculous.' I turned around and I stopped and started inquiring about what was going." In the video, Maplethorpe begins leading King to his nearby squad car while Lossing asks for the officer's name. In response, Maplethorpe stops briefly and turns around, saying: "I stopped her for violation of a pedestrian walk signal when she walked in front of me. I’m arresting her because when I was talking to her about the violation she tried to walk away. There you go." According to the Spokane County Jail inmate roster, King went through intake at the jail at 5:17 pm on Jan. 28, less than an hour after her arrest. She was released on Jan. 29. According to Kathy Knox, head of the Spokane Public Defender's Office, King is meeting with her counsel on Monday, where she may potentially opt to go to community court, which would result in the charges getting dismissed. King was unable to be reached for comment. John O'Brien, a spokesperson for the Spokane Police Department, tells the Inlander that King was charged with pedestrian interference and obstructing an officer under the Spokane Municipal Code, both of which are misdemeanors. "She was contacted for pedestrian interference and then the lack of cooperation and trying to walk away would be the obstructing, which is to hinder or delay an investigation," he says. O'Brien's depiction of the incident — which he gathered from the incident report from Maplethorpe's arrest — differs from Lossing's account. He says that Maplethorpe had to stop his car to prevent a collision with King. "This person that was arrested intentionally walked against a steady red light," he says. "He had to stop to avoid hitting her. That is the definition of pedestrian interference." Lossing says that King was not acting out in anyway prior to or during her interaction with Officer Maplethorpe. "The individual was not very confrontational, they were just confused," he says. "They weren’t belligerent or anything. Kind of just looked like they had a bad day and were walking slow and somber." In contrast, O'Brien says: "If you pull the [incident report] you will see the lack of cooperation, the vulgar language that was being used, and the suspect’s refusal to identify themself." Lossing adds that jaywalking is a "common thing that you do in this town," pointing to the absurdity of the arrest. As if making his point during the incident, in the video, two men jaywalk behind Maplethorpe while he is talking to Lossing. "Everybody does it [jaywalks] all the time downtown," says David Partovi, a local defense attorney who reviewed Lossing's video. "It’s just how you get around downtown." Pedestrian interference is a simple misdemeanor, meaning that it can garner up to 90 days in jail and up to a $1,000 fine. However, Partovi says that he thinks it's pretty rare for charges to get filed for pedestrian interference violations. "I’ve also never heard of anybody representing a client on that," he says. "I think it’s a fairly rare filing." O'Brien defended Maplethorpe's decision to arrest King after her alleged obstruction of his questioning. "If we lawfully stop and contact somebody and we’re trying to identify them and continue our investigation and they walk away, they are hindering our investigation," he says. Partovi says that while the officer might have had legal justification for the arrest, it wasn't necessarily the appropriate response. "It’s chippy, it’s petty," he says of the arrest. "There’s a difference between what you can do and what you should do. If that person hired me, I’d go to the prosecutor and say 'look at this video, give me a break.'" Lossing says that he's filed a complaint with the Office of the Police Ombudsman over the incident.